Robin Johnson lives in beautiful Brookings, South Dakota with her husband and their dog. When she first started sewing she was sewing by hand and then she moved on to piecing patchwork. Robin loves quilts of all kinds but she is especially drawn to bright colors. 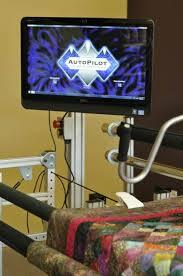 Now she enjoys the time she spends quilting with her longarm Autopilot Innova machine. Robin's Modern Quilting and Design business grew out of her love of quilting and desire to use her talent to start her own business. Robin will use her experience to decide on an overall quilting design for your project that will turn it from just a quilt top to a treasured quilt. She will even machine bind your quilt for you if you add that to your order. You can read more details on Robin's Modern Quilting and Design by clicking HERE. Robin's Modern Quilting and Design also sells finished quilts, wall hangings, baby quilts and novelty quilts. Click HERE to find out more. Robin collaborates on fabric choices and quilting patterns with her husband. That is handy because they both spend time on the quilting machine! Robin has been a member of the Brookings Quilt Guild since 2010 where she has met many other quilters through the Guild activities, workshops and quilt shows. Robin uses her talent to make quilts to donate to local organizations, cancer patients and friends who work with a MS support chapter. When Robin isn’t quilting she enjoys her time with her grandchildren plus traveling and camping with her husband and their dog. When the garden is ready to harvest you will find Robin in the kitchen busy canning for the winter.